A moment in comics history passed without any fanfare at all in the summer of 2017. It went unnoticed for several weeks — and while it's been discussed online in the months since, I was evidently the first person to ask the publisher directly about it, more than five months later. And now the confirmation is official: DC ended its newsstand editions of its comics as of the end of August 2017. "DC discontinued much of its newsstand distribution in late 2013 and early 2014," Vice President - Specialty Sales James Sokolowski told me today. Marvel had pulled out of newsstand distribution completely in 2013, but while DC's titles left most independent wholesalers then, the company had continued to distribute a limited slate of returnable titles through Ingram Content Group, which served Barnes & Noble, and Media Solutions, which served Books-a-Million. 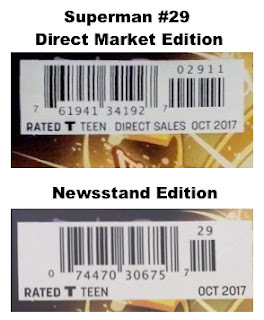 Ingram, however, sold off its business to TNG, formerly The News Group, as of May 1, 2017 — and a quick look shows that TNG's catalog, while evidently not complete, has only a handful of comics, and no DCs. That's because, as "Ski" said, DC chose the summer to wind down its newsstand presence. "The comic books that would have arrived in comics shops on August 29 would have been the final titles with newsstand editions." As mentioned here before — and in greater historical detail here — newsstand editions with different "trade dress," or cover elements, from Direct Market comic books became a necessity as the comic shop business grew in the late 1970s. Newsstand distributors and the publishers they served did not want non-returnable copies entering their return streams. With sell-throughs falling in the newsstand market, publishers focused more and more attention on comics shops — to the point where, in recent years, some aftermarket players (prominently, Chuck Rozanski of Mile High Comics) began to recognize newsstand editions as rare variants. At any moment, there's a host of newsstand variants on eBay. They also differed in many cases in price, as DC in recent times bumped up the cover price on several of its newsstand editions by $1 to cover the extra expense of offering the comics returnably through the channel. Ultimately, it was no longer worth it, and the era of DC newsstand availability came to an end. Even without fanfare, it was an event of some moment, as Kirk Ticknor, the reader who asked me to look into it, pointed out. DC's publishing efforts were intertwined with the newsstand distribution business right from the start, given owner Harry Donenfeld's role as founder of Independent News, a major player in distribution from the 1930s to 1970. Ultimately, DC would stay on the newsstands about four years longer than its top rival. A handful of titles remain returnable from various publishers, including the largest grouping, Archie's digests. So what were the final newsstand issues for DC? While Sokolowski did not provide a specific list, I took a look at Ingram's final order form, from May 2017, and found 20 titles on it. The most recent issues prior to the end of August appear below, as well as two titles that did not, Action and Aquaman, which I have confirmed had newsstand variants. All have October cover dates, and can be found in our Direct Market sales charts for August 2017. Consulting eBay, the Grand Comics Database, and (most helpfully) Mile High Comics, I was able confirm the existence of newsstand variants all the way up to Aug. 23's Harley Quinn #26. Based on Sokolowski's Aug. 29 date (on-sale in comics shops Aug. 30), there should in theory be two later issues, Wonder Woman #29 and Justice League of America #13 with newsstand variants, but those have not come to light. While it may look from the above chart as if DC's newsstand slate was dominated by comics from the end of the calendar month, that is in part illusory, as many of the series above were two-a-month titles, so the latter issue is being captured in the list. Biweekly issues would seem to be a less than perfect fit for the newsstand market in any case, as customers there are less regular in their shopping habits; that's probably just one more way in which the modern comics market doesn't sync up with the newsstand. Postal subscriptions for comics continue, if much reduced, so all the channels of the past haven't gone away. And Books-a-Million was at one point getting some comics non-returnably through Diamond, so that's a different matter. 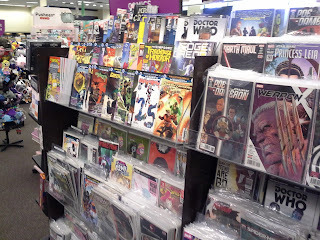 But today's returnable newsstands are just as likely to be embedded within a bookstore, and while comics remain a huge presence in those places, it's just in a different part of the store; with spines rather than staples. Readers looking for more information about newsstand editions should definitely read Rozanski's detailed discussion from a few years back. My own calculations about newsstand edition ratios, based on internal publisher documentation from the 1980s and 1990s, differ in some small respects; I hope to get that research online here in the future. Comichron founder John Jackson Miller has tracked the comics industry for more than 20 years, including a decade editing the industry's retail trade magazine; he is the author of several guides to comics, as well as more than a hundred comic books for various franchises. He is the author of novels including Star Wars: Kenobi, Overdraft: The Orion Offensive, Star Wars: A New Dawn, and the Star Trek: Prey trilogy. Read more about them at his fiction site. Great article John. This is truly the end of an era. I think DC comic books have been sold in newsstands since they first started coming out in the 1930s. When I was growing up, DC Comics were sold in newsstands, pharmacies, grocery stores, and book stores like Waldenbooks. That is now a thing of past. Now where's my walker, dagnabit? For whatever it is worth, I have found every single newsstand issue within the original, New 52, and Rebirth titles of Batman, Detective, Superman, and Action Comics up until the issues listed in John's article above, with one exception. 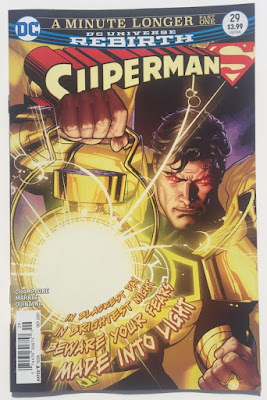 I have not yet seen a Superman New 52 #8 newsstand. But I'm sure it will show up eventually. Great job on the part of Mr Horne for getting that photo. That one may need to go in the history books! A year later, and TNG itself is gone, as of 31 December 2018 sold-merged to become ANC, American News Co.! One article proclaiming them the USA's largest periodical wholesaler.